Head-blind. That’s a term I first heard in Ivo Dominguez’s Keys to Perception: A Practical Guide to Psychic Development. It means, I think, “not particularly psychic”. Not seeing ghosts. Not reading minds. Not bending spoons. Not having visions. Normal, in other words. Or, as they might put it at Hogwarts, a Squib. Upon stumbling upon the term, I embraced it with glad recognition. That’s what I am! I thought. There’s a name for it! I’m head-blind. I have friends who are “clairs”. Clairaudient, clairsentient, clairvoyant. What they do amazes me. It’s very specific, very indisputable, and very much not something I recognize in myself. I am not a clair, and I often take pains to explain to people that I’m not psychic. But - and this is something I don’t generally take pains to explain or articulate, since I don’t understand it - I’m also not not psychic. For example, consider this morning. Husby and I slept late, and we both remembered our dreams. Husby has a dream where the gods were having an argument over whether to allow humans to continue on a quest for secret knowledge (for example, whether copper has certain hidden properties). In the end, they decide to let the humans try. At the exact same time, as it turns out, I have a dream where I’m trying to have a conversation with Husby about belief versus knowledge; i.e. why it’s important to have belief even in a world where knowledge is rightly valued. In other words, we’re both fast asleep and both dreaming - not about our high school math class or showing up to work naked or flying or space monsters - but specifically, about this very abstract concept: the place of knowledge in human experience. What a fun coincidence! I think. Then there was what happened during my morning rites. For a moment, standing before my ancestor altar, I had this image flash through my mind: the sun shining forth from my solar plexus, and my ancestors all bathed in light as I stood there before them. What a nice picture my mind just came up with! I think. I look down at the backs of the two cards I just drew. 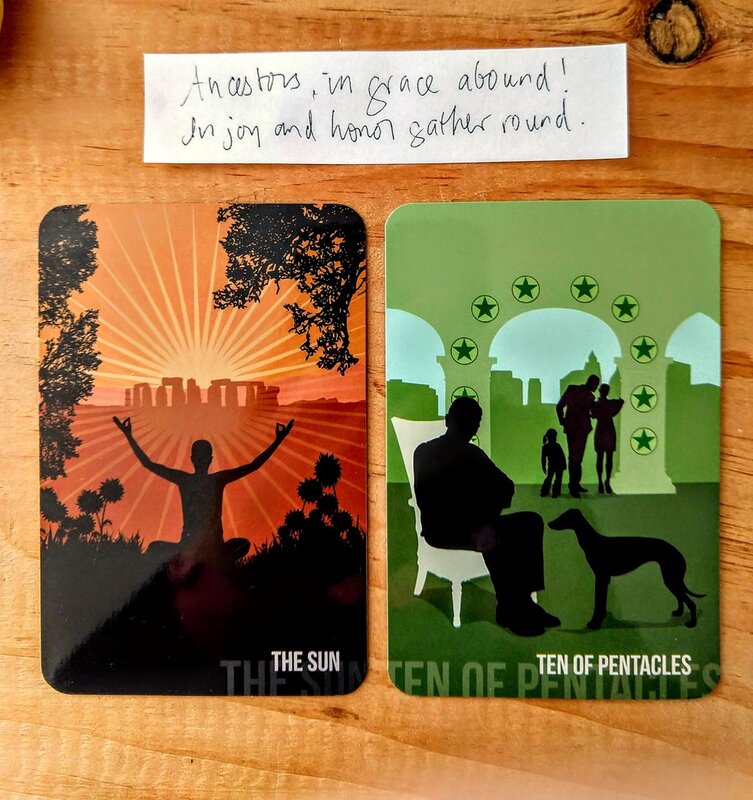 Wouldn’t it be funny, I muse, dreamily, if I got the Sun, since it’s Sunday, and the 10 of Pentacles, since today I’m going to go see my extended family and celebrate our parents who have passed on? Maybe the 8 of Pentacles, I don’t know. I turn over the cards. The Sun. And…the 10 of Pentacles. Oh look at that! Isn’t that funny! This kind of thing happens constantly. Little coincidences, passing by so swiftly they’re easy to overlook and easier to dismiss. When you notice it, it’s a hard sensation to describe. It’s the sense that there is design, intention, meaning in what seems to be an arbitrary world. It’s the recognition that that pattern of light and shadow passing over your cheek as you walk along doesn’t arise from nothing. It arises from the sun filtering through the fire escape you walk past, the interplay of natural forces, ambient information, human intentions. It is as predictable as a bar code and as unknowable as your own next move. I’ve described the art of divination like this: “You are a living poem. You are a walking mystery.” I’ve described the nature of magic like this: “Magic is like a joke - funny until you try to explain it.” My friend Chris Warnock, the astrological magician, likes to say: “Sometimes I don’t know if I’m causing the change or announcing it.” I think that’s a lovely way of putting it, because we are not dealing with conventional notions of causality. Chris uses the term “co-arise,” as in the intention and the result of a magical working co-arise. One does not cause the other in the sense we generally understand cause. For someone like me - a member of what I call “The Society of Persons Not Named Clair” - the experience of the otherworldly exists in the blind spot of my consciousness, the place where reason cannot reach. As a highly rational person, I know there are certain things I simply can’t perceive with the tools of rationality - and yet that doesn’t mean there’s nothing there. Just as in a car we use mirrors, or proximity sensors and cameras, to warn us of the car approaching in the blind spot of our natural vision, diviners use tools of their own. What tool depends on the diviner - cards, bones, tea leaves, clouds - but in a sense the methodology doesn’t really matter. The tool is just a mirror. It mediates between our human capacity and the field of information around us. For me, the weird stuff tends to aggregate around cards and dreams. The intentional meets the irrational in a field of information, and somewhere in the collision of those two, that which is unknowable can be known. The very word “meaning,” if you think about it, is double in nature - it can be what someone intends, but it can also be what something signifies. I suspect this double import, this ambiguity, lies at the heart of what is going on. The intention and the signification collapse in on each other, and the result is magic. When people ask me - indeed, when I ask myself - where my belief in the non-ordinary world comes from, I can’t generally come up with a clear answer, other than to try to explain generally that I feel it’s better to live in a world full of meaning than not. And I mean that in both senses: It is better to live in the world full of your intentions, and it is better to live in the world where things hold significance. And perhaps it is best of all to live in a world where both propositions are true at exactly the same time.